Let's face it. Vintage is in. More specifically, vintage-inspired pieces are in vogue now. Either that, or designers are just getting plain lazy. I noticed it all started with Tudor's Heritage Black Bay. Following that, almost every major watch manufacturer with a long enough history and heritage, started rummaging through their dusty attics for inspiration. Well, don't get me wrong. I ain't complaining. I reckon this is great. Simply because it allows the average Joe, such as myself, access to vintage pieces with a modern update. The 1953 vintage LE is not a very big watch by current standards. Ensconed within the 42mm stainless steel case is a ETA 2893 ( badged as a GL 293 by Glycine) GMT movement. The most prominent vintage-inspired detail is the off-white/ beige dial and "patinaed" looking hands. the lollipop second hand is a neat detail as well. Like the Airman Mystery I reviewed a couple of weeks ago, this model utilises a 24-hour dial as well. However, unlike the Mystery, this is a "purist" 24-hr dial GMT watch. A full rotation by the hour hand marks the completion of a full day (24-hour cycle). The entire watch face is split into AM and PM halves. For example, the time in the photograph above is 11:25AM, not 5:25am. The red date in the magnified date window provides a welcome contrast to an otherwise staid dial. The alternating- sized Arabic markers, though a nice and necessary touch for a dual time timepiece, makes the watch rather cluttered. The 24-hour dial layout also makes reading the time with a quick glance rather difficult. It takes a bit of getting used to. Unlike most dual time watches, the 1953 Vintage LE has three hands instead of the usual 4. The bidirectional bezel is used to represent the second time zone. The bezel is secured by a screwed-down lock at the 4 o'clock position. The screwed-down crown is surprisingly easy to operate despite its diminutive size. True to it's vintage DNA, the 1953 vintage LE's case is rather thin. Looking at its profile, one is able to crack the magician's code, in a manner of speaking. The long pin-holed lugs creates an illusion of a watch bigger than it really is. Compare this photograph above with the wrist shot later, and you'll see what I mean. The movement is visible through the exhibition case back. Lie the Mystery, the rotor is signed with the brand, model and the logo. Although the lume is pretty good. I am rather disappointed as the markers are not lumed. It is rather difficult to tell the exact time. It's rather bland and boring, actually. As I mentioned earlier, the long and relatively straight lugs appears to be "stretching the watch, thus making it look bigger. This is a really smart design as you can see, the watch appears to fit my wrist rather nicely. However, the case is a tad too thin for my liking. Puffing it up a little would have been ideal. The watch comes originally with with a black NATO strap but I prefer a more antique touch so bought a more suitable pair of leather for it. It is supposed to come with a vintage looking wooden box which I have yet to receive from the AD after 3 months as he claimed that the local agent, DKSH Singapore, had yet to send one to him due to some glitch in communication. This LE is limited to 600 pieces worldwide. However, what draws me to the watch is not the limited production but the vintage cues and purist dial. However, I would have preferred the case to be thicker and chunkier, and instead of a flimsy NATO strap, a more vintage looking pair of calves to complete the vintage appeal. The cluttered dial and purist layout needs some getting used to. But then again, I'm tempted to use the purist dial as an excuse to be late! Crystal : Sapphire - front and back. - Purist dial. A novelty I don't mind having. - Proportionately sized crown that is easy to operate despite its diminutive size. - Pin holes for easy strap removal. - Built quality and finish. - Long straight lugs to make up for the smallish size. - A possibly good excuse to be late thanks to the purist dial. - Case is a tad to thin. - Case is a tad small. A 44mm would have been ideal for me. - Purist dial needs getting used to. Beautiful watch and nice pictures....would love to get my hands on one. I am thinking of getting this watch too, and putting an after-market oyster bracelet on it. Please check in your anniversary Airman at the below-mentioned site. It's for all owners of the Airman LE to showcase their timepiece. Waouh, it is an amazing strap ! 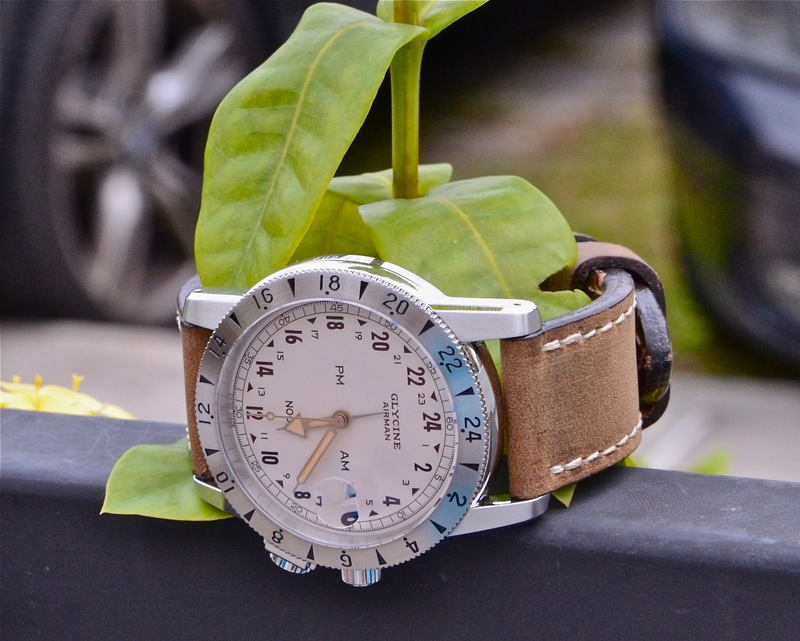 I find it works well on this Glycine watch. Could we know the brand of this strap please ? Gorgeous! Please pretty please, may I ask whare you got that strap? ?